On Saturday morning, November 5 2006, we left Xianyang (Shaanxi Province) on the next stage of our Chinese adventure with a 1700 km flight to Dunhuang (Gansu Province) in far western China. Then around midday on November 7, boarding the highest train in the world to cross the Tibetan High Plateau (29 hours, 2200 km at altitudes of 4000 to 5000 metres) to Lhasa, Capital of Tibet. It was the end of autumn and the end of the tourist season. We were extremely lucky to have perfect weather throughout. MAPS: A political map, and a geographical map, of the region are available for viewing. The flight from Xianyang to Dunhuang was a 2 hour flight with a stop-over at Lanzhou (my return destination after Dunhuang). 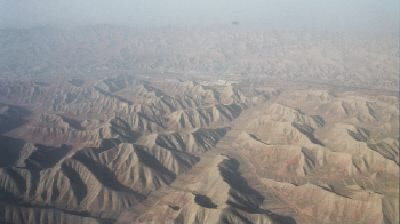 We flew over cultivated, but complex, terrain on route to Lanzhou. 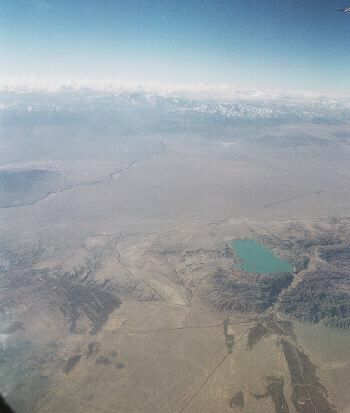 However, the terrain became distincly inhospitable after the aircraft departed Lanzhou and headed into the Gansu Corridor along the ancient Silk Road. The 900 km flight from Lanzhou to Dunhuang showed the forbidding terrain once traversed by camel trains along the Silk Road. Here there are broad valleys washed through the mountains with cultivated valley floors. The imposing wall of the Qilingshan mountain range on the horizon. 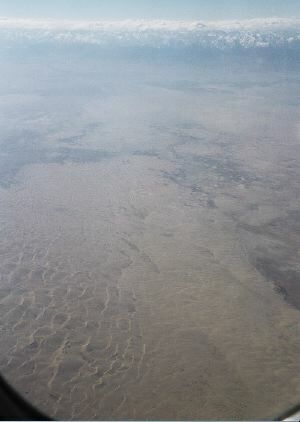 With the approach to Dunhuang the countryside changed from barren mountains to a flat plain. The water source for the oasis town of Dunhuang on the edge of the Gobi desert is the snow melt from the Qilingshan mountains well to the south. At first sight, the view from the hotel window seemed to be of a mountain range, but quickly it became apparent it was a massive sand dune! The primary purpose of our trip to Dunhuang was to see the Buddhist cave sculptures and paintings in the numerous caves carved into the lengthy cliff face above the Yanquan River.